We have a preschooler (age 4) taking an interest in learning to read as well as a 6 year old and 8 year old that are beginning readers. We were excited for the chance to review Essential Skills Advantage. It is a proven online reading and language learning program for grades K-6 that was developed by highly experienced teachers. What I found most intriguing and unique about Essential Skills Advantage is that instead of focusing on one specific area such as phonics or sight words, it addresses all of it. The name “essential skills” is really descriptive of what it is – it teaches all of the essential skills needed for children to learn to read. Plus, it does so in a way that is fun and appealing to kids! We have been using Essential Skills Advantage with all three of our children, but mainly with our older two children who are reading between the 1st and 2nd Grade levels. They have had a hard time learning to read due to their special needs, and finding resources that are helpful and appealing to them is always an advantage, and they have really taken off with Essential Skills Advantage! They have both been doing the lessons at the second grade level, and it has become our main reading curriculum. We use it 4-5 times per week. Sometimes we do just one lesson per day, and other days we do up to 4 or 5 depending on the lesson. Essential Skills Advantage has been great for our kids in so many ways. It is definitely visually appealing. It also has fun sounds. It always has a background sound of crickets, which is nice for helping them to just have a calmness while they are working. Although our youngest is only preschool age, he has really been showing an interest in reading, so although Essential Skills Advantage begins at the Kindergarten level, I wanted to see if he would be able to learn some at the Kindergarten level, and I am glad I did because he has not only been learning, but he has been loving it! He asks if he can do his lessons! There is just something extra special when your children are enjoying the learning experience! Essential Skills Advantage is unique in that I first have to log in to my parent account to do anything else. From my account there are SO many options. 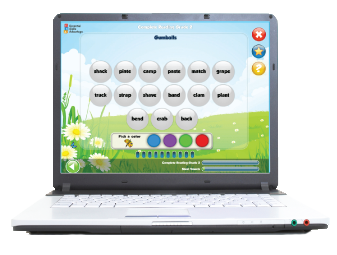 I can choose any of the Complete Reading programs for any of the grades (K-3) as well as access the Activity Guides for each, Fun With Spelling 1-3, Reading Comprehension 4-6, Vocabulary Builder 4-6, Spell Master Grade 6, Spell Master Grade 5, Spell Master Grade 4, Grammar Grades 3-5, Spelling Stumpers 1-5, and Spelling Stumpers 5-9. A lot of options, right? The bulk of the program (and what we use most) is the Complete Reading Program. As I mentioned, we use Kindergarten for our Preschooler and Grade 2 for our 2nd Graders. It really is a full program. The 2nd Grade program has over 1500 activities and is designed to give students all the reading and language skills they need by the end of 2nd Grade. The targeted skills are: Phonics, Sight Word Recognition, Grammar, Language, Reading Comprehension, and Spelling. Our kids have been doing a variety of activities from matching, typing, coloring (virtually), and more. Activities are repetitive yet fresh at the same time. For example, they will be working on the same vowel sound, but the activities they will be doing revolving around those sounds are completely different. It has really been a great approach for our kids. Something else I think is appealing about Essential Skills Advantage is that some of the activities feel like games to the kids. They know it is school, and they are definitely learning, but they are having fun as well. Because reading has been challenging for them, usually when I say “it’s time to work on reading” I get groans and pouts, but now I get “can I do the butterfly one?” Yes, the “butterfly one” is Essential Skills Advantage. Overall, I am thrilled with Essential Skills Advantage. The kids are making amazing progress, and they are truly enjoying the process! Those are the homeschooling moments that are so rewarding, and I am so glad we got to review Essential Skills Advantage. Essential Skills Advantage has started to offer a sponsored version of their program that is completely free. You can sign-up completely free at www.ESAlearning.com. Members can enjoy access to every course Essential Skills Advantage has to offer with sponsored advertising and some limited features. The Premium Plan is available for $9.99/month per child and offers additional features. Right now, through October 1st, you can sign-up for the Essential Skills Advantage Premium Plan for 50% off! The best part is the 50% discount will apply as long as you remain a member. The membership fee will be reduced to only $4.99/month/student! To take advantage of this amazing deal you must sign up using code TOS50. Be sure to connect with Essential Skills Advantage on Facebook, Twitter, Pinterest and Google+. Members of the Schoolhouse Review Crew with children of multiple ages shared their reviews of Essential Skills Advantage as well. See what they thought by clicking on the button below! I love this program, especially with having a Granddaughter who is just beginning to read herself. Love and program that will increase their skills in learning. Great product! You are so welcome! I do hope you share this with her because I do think your grandson could benefit from Essential Skills Advantage. There is a free version available, so they could always get started for free and decide later if they’d like to upgrade!